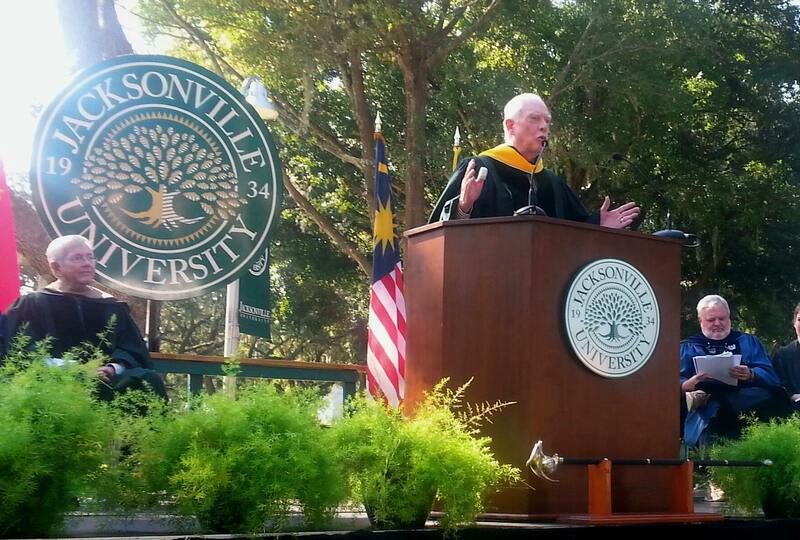 A state-of-the-art residence hall, inviting study spaces, cutting-edge academic programs, a completely updated fitness center, new labs, the U.S.’s leading food-service provider added to the JU team — and some words of wisdom from an Apollo moonwalker. Not a bad way to start the year for incoming freshmen and returning students. 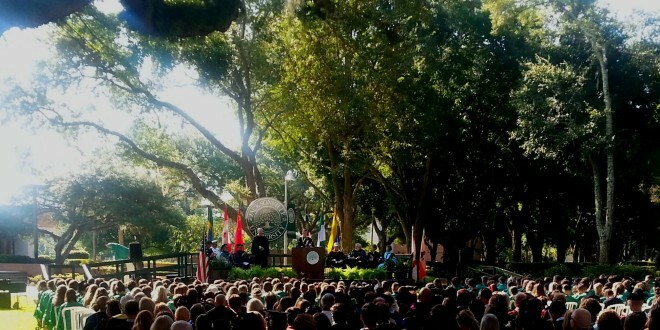 Apollo 15 commander David Scott addresses incoming freshmen at Matriculation. 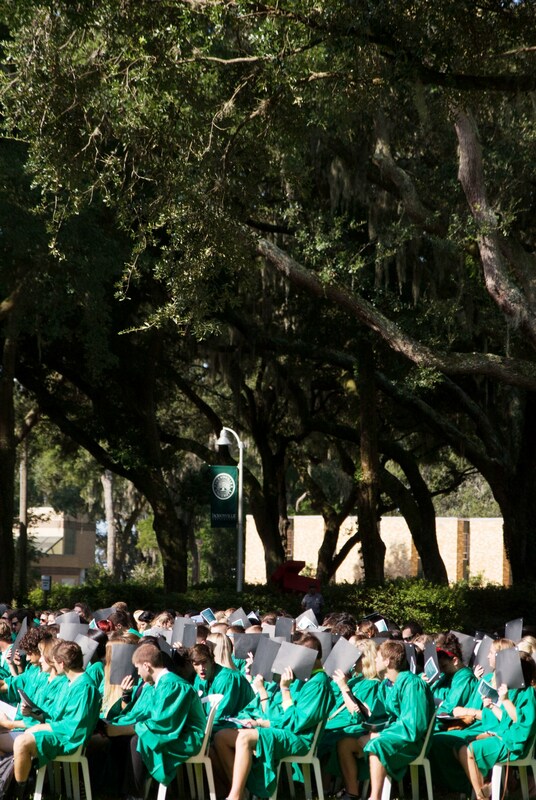 More than 500 Jacksonville University freshmen matriculated this past weekend, hearing from JU President Tim Cost, Provost Dr. Wenying Xu, Past President and Chancellor Emeritus Dr. Frances Bartlett Kinne and Apollo 15 commander Col. David R. Scott, among others. 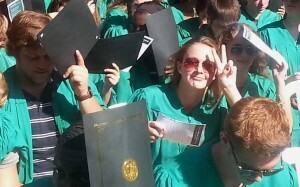 Incoming freshmen hail from 27 states; the District of Columbia; U.S. territories Puerto Rico and the U.S. Virgin Islands; and 10 foreign countries, including Brazil, the Bahamas, Canada, Cameroon, China, the Dominican Republic, Jamaica, Nigeria, Sweden and Venezuela. There are 128 student-athletes, or more than a quarter of the class, and almost 30 active-duty military, veterans or their dependents. The most popular majors are Pre-Nursing (55), Biology (31), Marine Science (31), Business Administration (30), Aviation Management & Flight Operations (27) and Kinesiology (27). 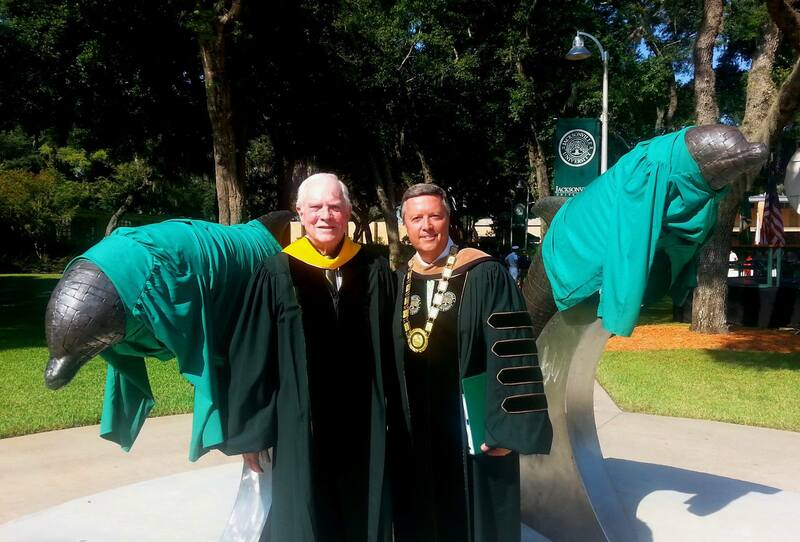 Scott, whose wife, Mag Black-Scott, is a JU alumna and Trustee, was the first person to drive on the moon, and one of only 12 to walk on it. He praised JU for its vision, momentum and close-knit community. The new $12 million North Hall, a 274-bed, three-wing residency designed with the idea of community development for students, both socially and academically, is now open. Kitchenettes; classrooms; and study, game and community spaces dot each floor. High-tech amenities include fiber-optic communications, CAT-6 wiring and cell phone range extenders. The student-to-RA ratio of about 25-to-1 is half that of typical residence halls, to provide more of the personalized attention that is a hallmark of a private university. Hundreds of thousands of dollars’ worth of new equipment and labs are now ready for students in the Swisher, Nelms, Reid Medical and Merritt Penticoff science buildings as part of the $120 million ASPIRE comprehensive campaign. 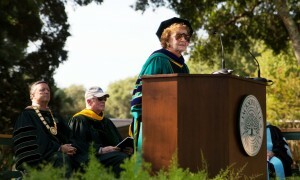 Dr. Fran Kinne speaks to the students. Aramark, known throughout the world for providing superior quality, has joined JU’s team as the chief provider of all food, facilities and grounds services. A completely revitalized Nelms Plaza collaborative outdoor study area is now open as part of a $250,000 project, offering cabana-style seating, canopied lounge areas and charging stations. The Nimnicht fitness facility in Davis Student Commons is newly refurbished, with all-new cardio and strength training equipment in partnership with Life Fitness. The 2,300-square-foot Alexander Brest Museum and Gallery in the Phillips Fine Arts Building is newly renovated and suitable for installation, video, 2-D and 3-D exhibitions. In addition, a state-of-the-art Neve soundboard is being installed for students in the Department of Music. In addition to facilities upgrades, JU is also known for its world-class, dedicated faculty who offer personalized attention, said Kinne. Apollo 15 commander David Scott (left) with JU President Tim Cost. With a new year ahead, Scott encouraged the students to soak up all the advice and information they could as they ponder their futures.